Normandy Luxe Competition large flange hubs were standard on Peugeot PX-10 bikes from 1967 through at least 1973. Gitane used them on their Tour de France models from 1978 until about 1972 and Motobecane on a number of their top models like the Grand Record during the early 70's. 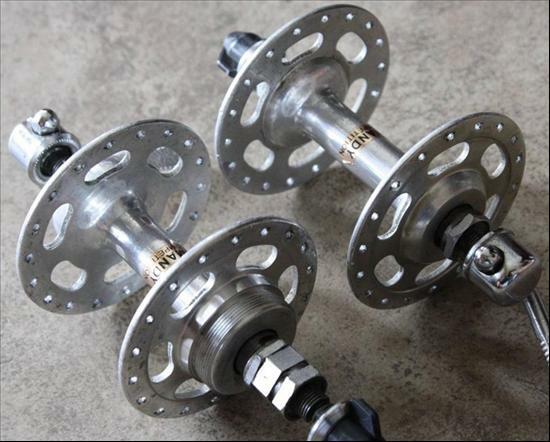 They were better quality than most of the hubs from that era except for Campagnolo, Zeus and a few other brands. Hubs with good cones and cups spun as smoothly as Campy NR hubs. The one short coming was the dust guards that were not removable. Repacking the bearings was a PIA. They used cones with a very large radius in the ball track area which looked almost flat. These cones were very difficult to find even when these hubs were being sold. The front hubs had the narrow French 96mm OLN width while the rear hubs were 122mm OLN.